The 27th Annual Interdisciplinary Plant Group Symposium was held from May 26-28, 2010, on the Columbia campus of theUniversity of Missouri in the Christopher S. Bond Life Sciences Center. 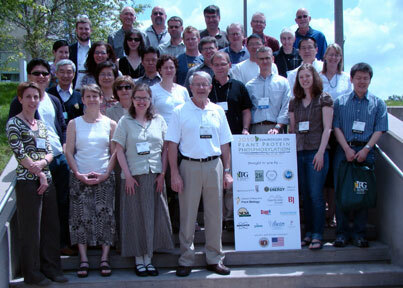 This year, the IPG sponsored the 2010 Symposium on Plant Protein Phosphorylation. This series of symposia are aimed at providing a broad survey of the latest advances in the field of protein phosphorylation and to promote interactions among plant scientists working in this field across the globe. This year marked the eleventh international Symposium on Plant Protein Phosphorylation. The first Symposium on Plant Protein Phosphorylation was organized by Dr. Douglas D. Randall and the Interdisciplinary Plant Group (IPG) at the University of Missouri (MU), Columbia, in 1990. This event represented the first U.S. and/or international meeting to focus specifically on plant protein phosphorylation as a unifying theme. Subsequent Symposia on Plant Protein Phosphorylation were held in 1993 (MU), 1994 (Britain), 1996 (MU), 1997 (France), 2000 (MU), 2001 (Austria), 2003 (MU), 2005 (Japan), and 2007 (MU). The Interdisciplinary Plant Group would like to thank the following sponsors and exhibitors, without whose generous support the 26th Annual IPG Symposium would have not been possible. The winner of the Biochemical Journal's Young Investigator Poster Award at the 27th Annual Interdisciplinary Plant Group Symposium was Christian Burr, Christian Burr, Curriculum in Genetics and Molecular Biology, University of North Carolina, Chapel Hill. 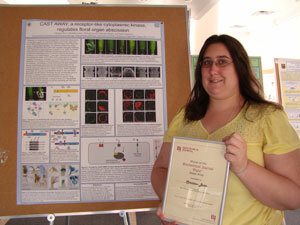 The winning poster was "CAST AWAY, a receptor-like cytoplasmic kinase, regulates floral organ abscission," co-authored by Christian Burr, Michelle Leslie, Catherine Wright, Mark Daniels, Sarah Liljegren.